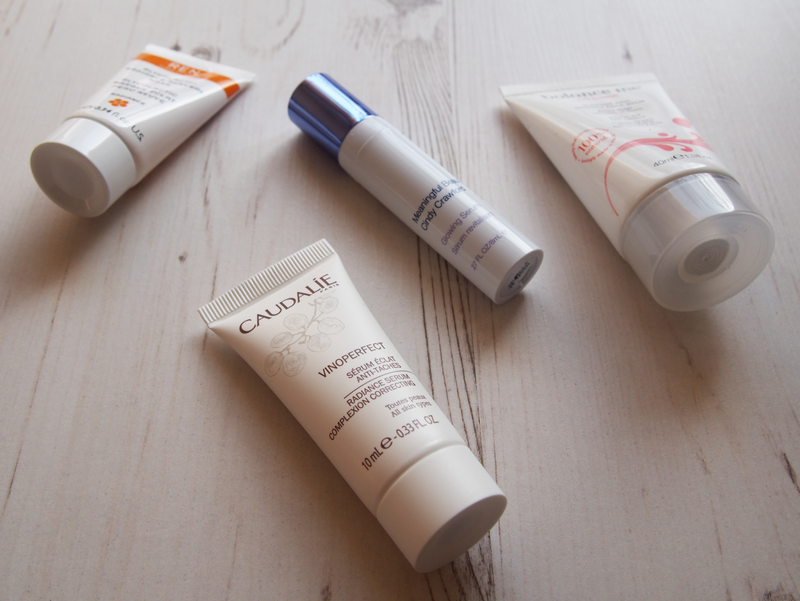 My collection of little samples has been slowly building up into quite a considerable bulk of trial sized skincare goodies, so I thought I'd give a few a go. 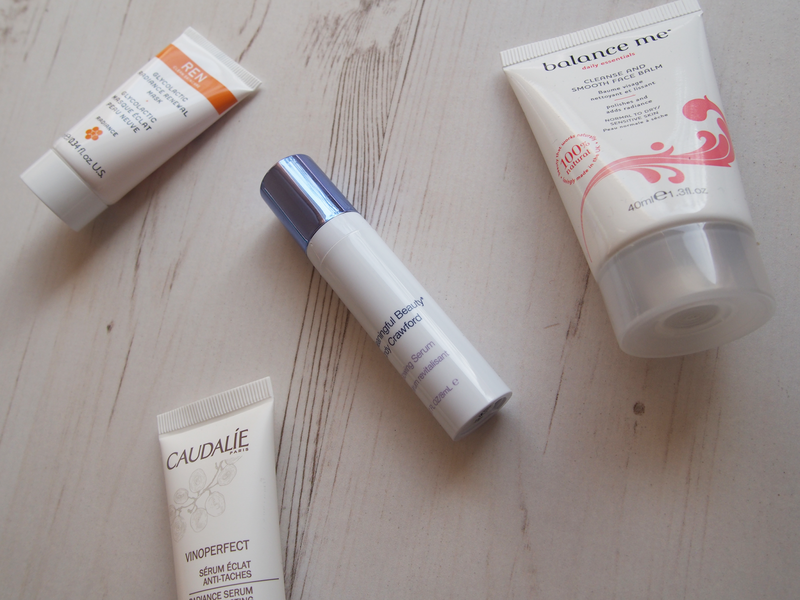 What I love about the sample sizes is that you can try so many amazing products (and they're often free) and find some real gems that can become staples in your beauty routines. 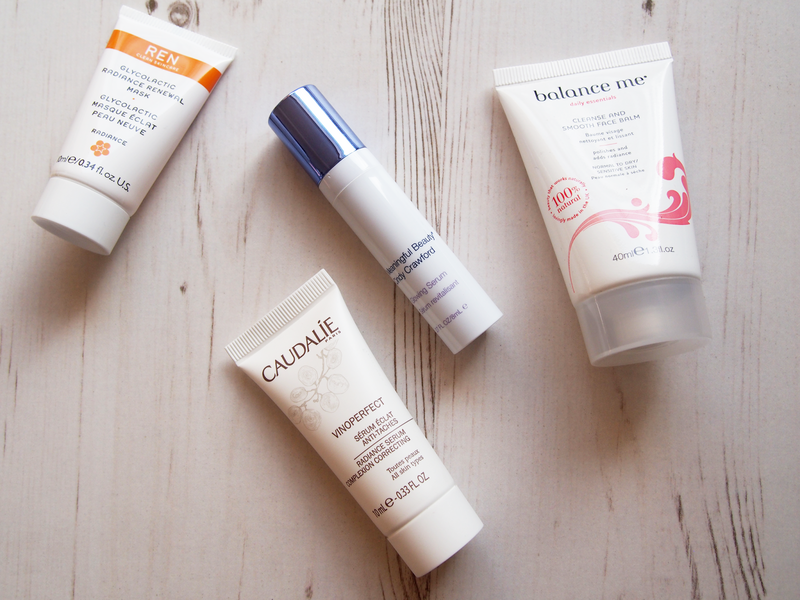 And of course, there had to be a cleansing balm in the mix (typical). I feel like I'm the only person in the beauty blogging community who hasn't given Ren's Glycolactic Radiance Renewal Mask a proper whirl. As you might be able to detect, in this months sample collection its all about radiance. Summer is almost here and having radiant glowy skin is a must. I usually use a mask twice a week so I've been using Ren's one for a sumptuous Sunday pamper, and topping up with Origins' Clear Improvement mask on a Wednesday evening. 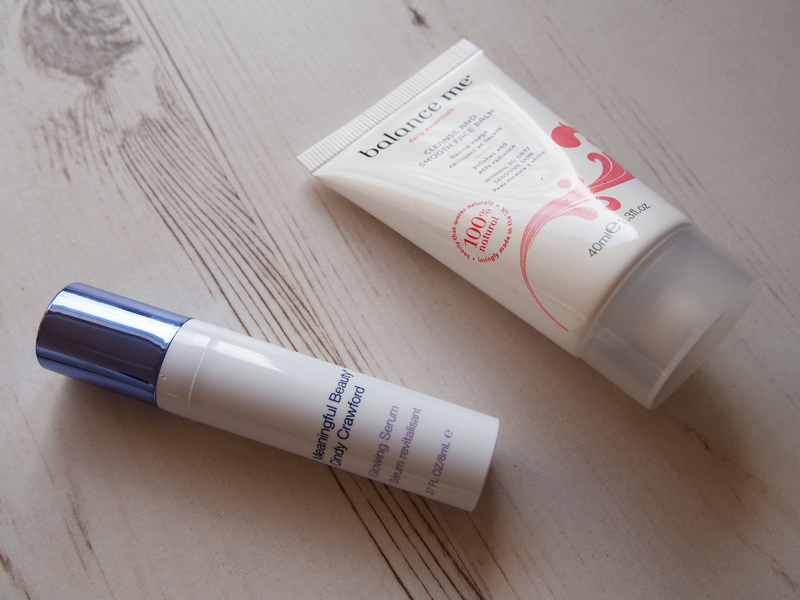 The combination has been really helping my skin keep its glow and stay detoxified for longer. Cleansing just isn't enough sometimes. Whats special about the Glycolactic mask is that not only does is renew your complexion entirely, it also has a wonderful exfoliating ability that makes a huge difference to the look and feel of my skin. Perfect. Meaningful Beauty, if you didn't know already, is Cindy Crawford's world renowned beauty and skincare range that is quickly becoming one of my favourites. Thanks to Carly Bybel, I implemented her Eye Cream into my routine a couple of years ago and don't regret it for a second. This time around I've been trialling her Glowing Serum which is light pink cream very similar to the consistency and look of Clinique's Custom Smart Serum. Whats great about this serum is that it complements my other serums and skincare products really well, layering* could not be easier. I've noticed a significant 'glow' thanks to this serum and I highly recommend it. Balance Me has certainly made an impact in the beauty industry of late. When a new buzzed about skincare line is released, I always look for a new cleansing balm to try. And guess what? They have one. The Balance Me Cleanse and Smooth Face Balm should have a place in heaven along with Eve Lom's everything, because not only does this stuff hydrate and replenish as brilliant cleansing balms should, it also exfoliates with its gently polishing oatmeal powder. Add a splash of warm water and you have a soothing milk, and all the way through you can enjoy the subtle hints of citrusy goodness. Don't forget to apply to dry skin first, that way you can get the best out of it. I think its evident that I love this stuff. Last but not least I tried Caudalie's VinoPerfect Radiance Serum; a correcting, balancing and soothing light cream perfect for day wear skincare. Believe it or not, this is only the second product from Caudalie that I've EVER tried, where have I been? We all know how much I love their famous Beauty Elixir, and of course this new serum works hand in hand with it. This cream is so light, there's no unnecessary oils or thickness to it, it's perfect for the day time. When planning my day time skincare I always stick to light products that won't make my face look oily for too long, so this fits in perfectly. When I use it, my skin not only feels so smooth but radiance is an understatement. Yet another skincare gem I won't be saying goodbye to anytime soon. What sample sized goodies have you been trialling lately? Found any gems? Tried any of mine before? *Layering skincare products in your routine beginning with a toner and ending with a moisturiser. Its said to be the best way to keep your skin looking and feeling flawless and detoxified.